German artist Hannah Höch (1889–1978) is perhaps best known for her Dada photomontages, cut-and-pasted images clipped from illustrated magazines that probe below the surface of Weimar-era politics and culture. Yet even when Höch was connected to Dada—indeed as the only woman associated with the Berlin dadaists—her work showed an exceptional regard for formal and aesthetic concerns. After 1922 she became closely aligned with artists such as Kurt Schwitters, Hans (Jean) Arp, Sophie Taeuber-Arp, and Theo van Doesburg, and correspondingly her compositions became more geometric. 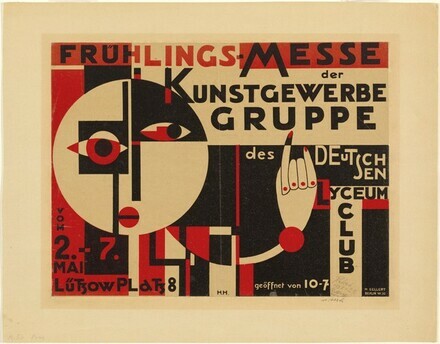 Frühlings-Messe der Kunstgewerbe Gruppe (Spring Fair of the Applied Arts Group) was created at the height of Höch's engagement with constructivism and is her most dazzling, rare, and important print. It also ranks as one of her finest works in any medium and among the great visual accomplishments of international constructivism. In true constructivist fashion, Höch successfully drew attention to the work's message in a seamless melding of text and image. Adopting the Russian constructivists' preference for red and black, she tempered the combination by introducing a warm brown paper, ingeniously integrating it so that it reads not only as skin tone and geometric form but also as lettering and backdrop. Areas of pure geometric abstraction, such as at the bottom center, speak most strongly of constructivism, but Höch's particular use of form and color is entirely her own. The composition shifts from abstraction to figuration and back again. Color relationships likewise shift. Indeed, a virtuoso aspect of the work is that Höch maximized the effect of printing only two colors, creating a design that is remarkably complex yet distinctly readable. Considering that Germany's so-called New Woman was the focus of Höch's work in the 1920s, it is apt that this lithograph was done for the German Lyceum Club, an elite women's association. The features of the woman in Frühlings-Messe—perfectly round face, striking eyes, rigid nose, and bisected mouth—evoke masks from Africa or Oceania. Höch shared the German expressionists' interest in tribal art, evident elsewhere in her series From an Ethnographic Museum, begun about the same time as this work. Like the photomontages in that series, in which Höch fused images of tribal objects with those of contemporary women, Frühlings-Messe also suggests a mixture of types. Is the woman who dominates the composition black or white? Höch suggests both. (Carus Gallery, NY, until late 1970s); (Merrill C. Berman, Rye, NY); purchased 2008 by NGA. L'Affiche au 20e Siècle, Musée des Beaux-Arts de Montréal, Montréal, Québec, 1985. Three Berlin Artists of the Weimar Era: Hannah Höch, Käthe Kollwitz, Jeanne Mammen, Des Moines Art Center, Des Moines, IA, 1994. Avant-Garde Graphics 1918-34, National Touring Exhibitions, Hayward Gallery, London, 2004. Brodie, Judith. "Hannah, Hoch, Frühlings-Messe der Kunstgewerbe Gruppe." National Gallery of Art Bulletin no. 40 (Spring 2009): 26-27, repro.